If you find yourself with a water heater that keeps shutting off - we may be able to help. There are eight possible reasons why your gas water heater may be shutting off. Now, it's important that a professional plumber address these problems. In the Atlanta, Ga area you will find these professionals at Atlantis Plumbing. We are available 24 hours a day, 7 days a week. But as a responsible homeowner - you should have an idea of of the details of each of these possible causes for your hot water heater problems. The gas water heaters built today have air inlet screens. If this screen gets clogged up it can't function as it's supposed to. Which means that it won't let in enough air which is needed to keep the gas burners on. These are installed at the bottom of your water heater. As can happen with many appliances, they can get dirty and therefore clogged. Things like dust, pet hair, lint, dirt, etc. Call in a professional plumber to properly clean and/or replace these air inlet screens. The thermopile component of your water heater is most often a metal rod located next to the pilot burner. It's purpose is to trigger the gas controls to turn on. Basically, the pilot light is on, the thermopile is heated by this flame and generates electrical energy for the purpose of powering the electronic components inside the gas controls. So, if this component gets dirty for any reason, it won't be able to power up those components. Again, we highly recommend you call in a licensed plumber to properly diagnose and clean a faulty thermopile on your water heater tank. The purpose of the thermocouple apparatus is to act as a safety device. It turns the supply of gas off when the pilot light dies out. If the thermocouple in your water heater malfunctions in some way, the pilot light simply won't stay on. We recommend again that you hire a qualified plumber to diagnose and repair any problems you may have with your water heater. The gas valve in your hot water heater is the device that distributes gas to the water heater unit. This gas lights the pilot light and the gas burners which of course eventually heat the water in the tank. So naturally, if the valve has broken or gotten damaged in some way, you will have a problem with your hot water supply. Assessing this problem is best left to a proficient and competent plumber, like the ones at Atlantis Plumbing. A leaking water heater tank can extinguish the pilot light. In some cases the leak may only occur when the tank is heating. As water is heated, the water volume expands and puts pressure on the seams of the tank. If you think or know that your water heater is leaking, call in experienced plumbers to fix the problem immediately. Yes, high humidity (and we do get that here in Georgia during the summer months) can cause your water heater tank to sweat which in turn causes water to drip onto the thermocouple which in turn causes it to malfunction. A blocked vent in your hot water tank can cause the burner chamber to overheat. This then results in burning out the thermoresistor. 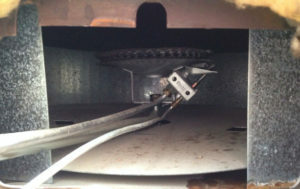 A failed flammable vapor ignition resistant system can prevent combustion air from reaching the heater which could put out the pilot when the burner kicks on. If you are having problems with your hot water heater, call us today at 770-505-8570.